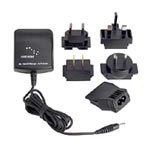 The Iridium AC Travel Charger provides rapid charge to the Iridium battery in Extreme (9575), 9555 and 9505A handsets via AC electric wall outlet. Allows use of the phone while recharging battery. Battery Charge Time to 90% capacity is 3 hours at 25 C (77 F). For optimum performance only charge your battery between 0 C (32 F) and 40 C (104 F).